Give your leftover Thanksgiving turkey a tasty new look with this BBQ Turkey Flatbread! You might spend hours prepping and cooking the big meal on Thanksgiving day, but many people would argue that it’s the leftovers that they actually wait for all year. 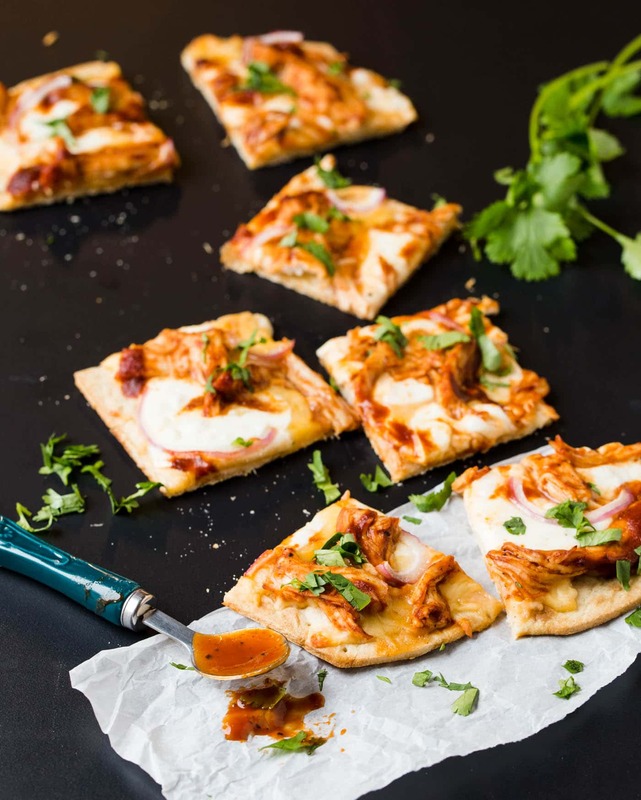 Give that extra platter of turkey a makeover with this recipe for BBQ Turkey Flatbread, a quick and easy snack that is perfect for munching during the weekend football games! Turkey is actually pretty near and dear to our hearts here at Garnish with Lemon as Minnesota – our home state – ranks #1 nationally in turkey farming with 450 turkey farm families raising 46 million turkeys each year. Since about 95% of Americans eat turkey at Thanksgiving, November is a busy time of year for Minnesota turkey farmers. Want an inside look about what it’s like to raise turkeys in Minnesota? Follow turkey farmer Wayne Knudsen of K & B Turkeys as he takes you on a virtual tour of his farm. 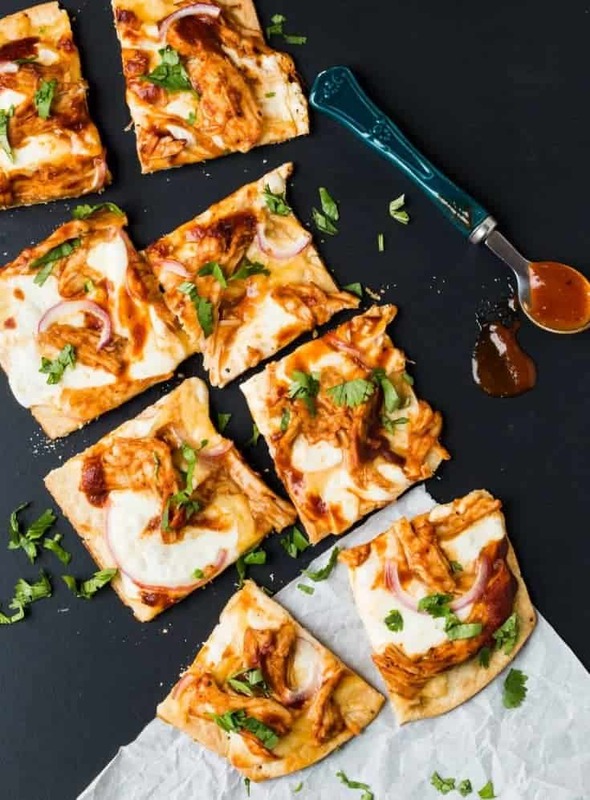 Prep for this BBQ Turkey Flatbread recipe couldn’t be easier (which is a relief for anyone tasked with cooking Thanksgiving dinner). Simply chop or shred your leftover turkey. Grab your favorite flatbread from the grocery store along with some cheese and your favorite bottled BBQ sauce. A few red onion slices and chopped cilantro are all you need to pull this dish together. Interested in learning more Thanksgiving tips and tricks? Follow the Minnesota Turkey Growers Association on Facebook, Twitter, and Pinterest. Or join the #ServeTurkeyChat on Twitter on Thursday, November 17, from 12:30-2:00 pm CT, where Minnesota Turkey and other Thanksgiving lovers will chat about all things Thanksgiving-related – especially the bird! Disclosure: This post was sponsored by the Minnesota Turkey Growers Association. All opinions are our own. Thanks for supporting the organizations that make Garnish with Lemon possible! This quick and easy flatbread comes together in minutes! Place flatbread on a baking sheet. Combine turkey with BBQ sauce in a small bowl. Set aside. Sprinkle Gouda cheese on flatbread. Layer Mozzarella on top. Divide turkey on top of cheeses. Add red onion slices. Drizzle with additional BBQ sauce. Bake for 13-17 minutes or to desired degree of doneness. Cool slightly, cut into squares and sprinkle with cilantro. Serve warm. I didn't include exact ingredient amounts since flatbread and pizza crust sizes vary. Make it your own!